1.) It is disheartening and a sore spot when I hear Angels' fans bash one of the franchise's best closers - I don't claim to know K-Rod and maybe I tend to fall into the side where I plead ignorance to his basic intentions as far as enjoying personal success and helping his team win but the disrespect is galling for a guy who should be beloved as an elite closer. 2.) Despite the fact Angels' owner Arte Moreno seems to reward players with long-term contracts, where he has to overpay if he has to, fans suddenly want to lowball K-Rod - it is a self-fulfilling prophecy for a core of Angels' fans to see K-Rod fail, blow out his arm or just leave. Suddenly it is the Angels' goal to watch out and not cave in. They preach the sentiment that K-Rod is some sort of mercenary and will leave for greener pastures just because he can. 3.) A core of Angels' fans can't seem to tolerate or dismiss K-Rod's 'antics' as typical closer bravado - which closer in Major League Baseball doesn't have an edge to feed off from? A jerk of the neck, a twist, a symbolic gesture to state 'the game is over?' Why are Angels' fans dissatisfied with K-Rod? Maybe it is Tego Calderon's fault. Maybe if K-Rod had an entrance music fans can relate and chant to [like Guns and Rose's "Welcome to the Jungle," Metallica's "Enter Sandman" or "Hells Bells" from AC/DC], he'd be held in higher respect. 4.) Fans want Scot Shields to close in the worst way [to put it politely and in P.C. terms, wanting to see the 'fan favorite' to succeed [for whatever reason besides just pure performance] where they feel the guy they don't want is somehow not doing the job to their satisfaction syndrome] - Shields is the guy whose arm went dead and got a little nutty during a prolonged period of time in 2007. Love the guy's contributions, but he had a 7.36 ERA in the second half last year, including a 9.00 ERA in August. I know for a fact, there is a core of fans, who still want to annoint him the closer, while burying K-Rod's accomplisments. It isn't everyone else in the Angels' bullpen making up for K-Rod's supposed faults, it is the other way around. 5.) Wouldn't it be ironic if he did leave and saved 50 games for some contender like the Detroit Tigers - and help lead them to a World Series championship? Angels' fans just don't know how good they have it. 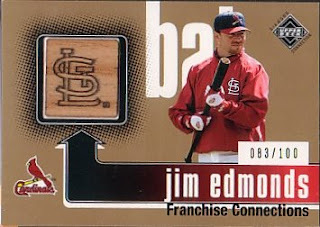 2002 Diamond Collection Jim Edmonds Franchise Connections bat card serial #'d 083/100 and 2003 Topps Finest Moments George Foster autograph - I paid $7 for the bat card with the St. Louis Cardinals' logo engraved on the game used bat swatch. I think I overpaid for the Edmonds' card, but I collect his cards on the side and I thought it was somewhat unique. I paid other $7 for the Foster certified autograph - maybe several years ago, I wouldn't have cared for the card, but I needed to fill a hole in my award winners collection. 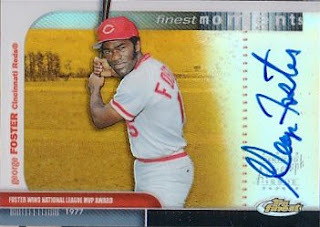 I had to pick up the hard signed certified autograph card of the 1977 National League MVP. 2007 Donruss Elite Extra Edition set [$9.00 BIN plus $7.95 s/h on Ebay] - hand collated sets maybe a low-risk, low-reward purchase if you want to see what a particular product's base cards look like. Some releases, particularly 'late in the year' feature base sets with a handful of first-year player cards and/or true rookie cards. Throw away the coach's cards - apparently former Utah basketball head coach Rick Majerus' card comes in handy. Ignore the other sports' cards - keep the Jennie Finch and Amanda Beard cards handy though. Gawk at the Summer Sanders card - wondering why Donruss didn't use a The Sports List [remember that show] era image [or even an NBA Inside Stuff] of Sanders. Her autograph would be going for more than $10-$15 on EBay, if a more attractive image was used. Wonder why Donruss had to included two Cobi Jones base cards in the set - only to smirk and realize the other card is of women's soccer player Michelle Akers. On Ebay, I picked up the following pack lots - I've always been burned picking up a bunch of packs, with the idea I'm going to pull something of note or at least something better the discount price is not telling me. I do think the mid 1990s were the peak as far as nice, modern baseball cards being printed - you can argue there are better types of cards today as far as being autographed, being a parallel or having game-used swatches, but nothing compares with the 1990s as far as aesthetics and actual graphics are concerned. Each lot had a different s/h cost and I thought I'd be only paying the highest cost [$6.95], but the combined shipping on the invoice is $13 - I'm sure you can ship everything in one box [actually the seller shipped it in two boxes] and I think if you buy multiple items from one seller, they should be able to only charge you one s/h fee. I e-mailed the seller after the auction had ended the response was it is $6.95 [highest] for the first auction and $3 each for next two. The total ended up being 45 packs [about 492 cards] for $37 - you got punked already since these are not the latest and greatest, but you like the pain of confusion [lack of clarity] leading to impulsiveness. Where are my priorities? What can I really do empower myself in this endeavor called collecting? 1995 Pinnacle, 1997 Pinnacle, 1997 New Pinnacle & 1997 Leaf packs [20 packs/8-12 cards in each pack; $7.99 plus $6.95 s/h] - one of the things I'm cautiously aware of is always being burned picking up a bunch of 'close out' packs, with the idea I'm going to pull something of note or at least something better the discount price is not telling me. When I got these in the mailbox, I just started ripping and ripping - it looks like these packs were recovered firebombed hobby shop. I listed the notable cards I got out of each pack [though the order I might have opened them might not be in order] as far as semistars/all-star types as well as random common cards I collect for whatever reason or the other [that may not be fully explained in this paragraph]. Pack one - Don Mattingly, Garret Anderson, Chuck Knoblauch [awesome action], Milt Thompson [awesome outfield action], Ricky Bones [pitchers hitting], Bryce Florie [beyond the glory], Rick Wilkins [tools of ignorance]. Pack four - Jay Bell [awesome action], Tom Pagnozzi [tools of ignorance], Danny Bautista [awesome outfield action], Chipper Jones, Brent Gates Upstarts US7 insert [retro uniforms], Kevin Stocker [awesome action], Todd Zeile [awesome action], Ozzie Guillen [high toppers]. Comments - nothing too exciting in here. Pack six - WORST PACK AS FAR AS THE CARDS INSIDE ARE CONCERNED; are any salvagable? Think of gum stains on old Topps cards, only with ink remnants from other cards in the pack. Comments - cards have not aged well in 10 years of being banged around in unopened pack form. Most have stuck to each other and left imprints from one card to the next. IF I'd left these cards unopened for the next 10 years, they would have probably been virtually unrecognizable. Pack six - Mark Grace, Paul O'Neill, Moises Alou, Billy Wagner, Jose Canseco [hats off picture on reverse], Eric Davis [broken bat shot], Ken Griffey Jr.
1995 Upper Deck Minor League packs [14 packs/12 cards in each pack; $7.99 plus $5.95 s/h] - the design mimics the 1995 Major League set, but features minor leaguers. Even though it is worthless, I should be able to pull a number nice looking cards, featuring 'Major League stars' pictured as minor leaguers. Comments - this was probably the best packs I busted out of the 45 packs I got since they were the cleanest. While hardly valuable, I got some nice looking minor league era cards of Major League veterans and stars. 1995, 1996, 1997, 1998 and 1999 Upper Deck baseball packs [11 packs/10-12 cards in each pack; $7.99 plus $4.95 s/h] - I'm not exactly focused on the quality of the pulls, just the desire to rip packs. Hopefully the packs I receive will be clean, so the cards I pull won't be damaged. Comments - not a lot of stars at all, even guys who starred in the mid 1990s and would be considered 'has beens' today. Comments - nice to pull a Junior insert, though it is worth about two quarters. Comments - nothing too exciting; seems to be the theme in these breaks. Pack two - Brad Fullmer [hats off], Rickey Henderson, Sammy Sosa [Foreign Focus subset], Darryl Strawberry [bonus baby; Derek Jeter makes a cameo in the background, even though the image zooms in on Strawberry signing an autograph in the dugout], Will Clark, Jose Canseco. I picked three packs of 2007 Donruss Elite Extra Edition [$6 each at a show] - the packs are nice and thick [duh, because of the tick white stock filler Donruss uses], with No. 1 overall pick David Price as the coverboy on the pack. Pack one - Norm Stewart #1339/1500 School Colors insert; he is a college basketball coach and that is all I have to say about that. Pulling cards of frumpy old guys out of a brand revolving around 'youth' is a little deceiving. Pack two - Sam Runion #35/494 Turn of the Century autograph insert; not bad. Pack three - Darwin Barney base card; he seemed to be in the middle of Oregon State's baseball back to back College World Series championships in 2006-2007. Comments - I got my first sniff of this product and out of my three packs and I was able to pull an autograph. I picked up a box of 2007 Bowman Draft [$55 at a show] - this product may have jumped the shark already because people seem to equate Bowman Chrome as some sort of holy grail of first-year cards and it seems serious collectors/speculators buy this product by the case, perhaps ruining the charm [whatever that means] for the casual baseball card collector who chooses to only pick up one or two boxes. You should still get one coveted on-card draft pick Chrome autograph per box [most of the time] that should hold its value [whether or not it is classified as a true rookie card] - as long as the player is on the fast track to Major League stardom and not projected to be a career reliever in AAA. There are lots of cards [of first-year players] to flip through for the collector in you [even though the casual collector might wonder who all these guys are] - including Chromes of 2007 first-year players and MLB rookies for what seems to be a low-end price [I'd rather pick this up than some random Upper Deck product]. Compared to Donruss Elite Extra Edition, Topps isn't forced to make this product a multisport product - the first-year professional baseball players are pictured in Major League uniforms [whether or not Topps had to pull some strings and possibly had to Photoshop MLB uniforms into an image of No. 1 overall pick a David Price] and at the very least cards of first-year players are licensed by Major League Baseball. Comments - I was disappointed I didn't pull any first-year Chromes of 2007 draft stars like Matt LaPorta and Jason Heyward among others. Among the 'okay pulls' from the box, there are some imperfections. My autograph is of a position player, who may not be a future stud, but is now in the collection I guess. I don't know if it makes this blog less readable - but I've decided to skip the festivities of the holidays, Christmas and New Year's and plow through. There is nothing like a true rookie card in your hand picturing a Major League rookie - especially if you pull one out of a pack, featuring a rookie star or a player projected to be pretty good. After reading a baseball card message board post about picking up 2007 parallels of Alex Gordon, Cameron Maybin and Justin Upton for cheap - I got curious as to whether their original 2007 cards [not the parallels] would be considered true rookie cards. I was at a Walmart and they had a Beckett magazine to leaf through. When I saw listings for some of Gordon's 2007 cards, there was a just an RC designation, but no parenthesis - I didn't quite understand how Gordon's 2007 cards can be considered rookie cards, because there seemed to be a glut of Gordon cards [Bowman, Bowman Chrome, Bowman Draft, Bowman Heritage, Bowman Originals - only from Topps of course since they can sign minor leaguers to make cards of them before they reach the Major Leagues] from last year [aside from the 2006 Topps cutout that wasn't supposed to be, supposedly], while Maybin and Upton had their share of cards [nearly the same Topps products Gordon is in, plus cards from an AFLAC set produced in 2005]. I couldn't see Beckett price guides labeling the 2007 cards of Gordon, Maybin and Upton as anything but rookie cards (RC) with a parenthesis - when I looked at another Beckett, I saw Gordon, Maybin and Upton's 2006 cards listed with no designation. Why aren't 2007 cards of Hunter Pence, Phil Hughes, Dustin Pedroia and Ryan Braun considered non-parenthesis rookie cards - the answer is probably because Pence, Hughes and Pedroia had rookie cards in 2004 products [produced by Topps, Fleer Top Prospects, Donruss Elite Extra Edition and/or a combination of all] while Braun had true rookie cards produced by Topps in 2005. The rookie card rules changed the way first year cards produced by Topps were classified [company had to differentiate the numbering] - so in some respects, how could the 2006 cards of Gordon, Maybin and Upton be considered true rookie cards? They basically are not recognized as having any status with regards to being a first-year card or rookie card. Certain first-year cards [parallels and autographs] - will still command the most value as opposed to just your basic run of rookie cards. 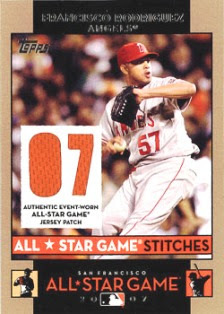 The fact you can find true rookie cards of Gordon, Maybin and Upton however adds some name value to certain 2007 products featuring the three players in addition to other rookies like Tim Lincecum and Joba Chamberlain. Its kind of disappointing however because even though there have always been a 'better card,' the true rookie cards you'll pull out of packs these days are likely worth $3 compared to cards [likely autographed and certified] worth $75-$150. It isn't worth bragging about to pull cards only worth a few bucks - when it comes to rookie/rookie-year/first-year/xrc cards, there is some vanity involved in having one of the best ones, even for the stereotypical collector types who would think nothing of their own appearance.